Calling for urgent species discovery programmes in world’s biodiversity hotspots, a recent research review by major ecologists points out that the hotspots still harbor more number of unknown organisms than any other part of the earth. But they are under threat from severe habitat destruction which may push them to extinction even before anybody trace and record their existence, warn the scientists. According to the research review which was published in the latest issue of Trends in Ecology and Evolution Journal, the missing species are highly likely to have a restricted geographical range as well as small bodies or difficult traits which make it harder to find them. 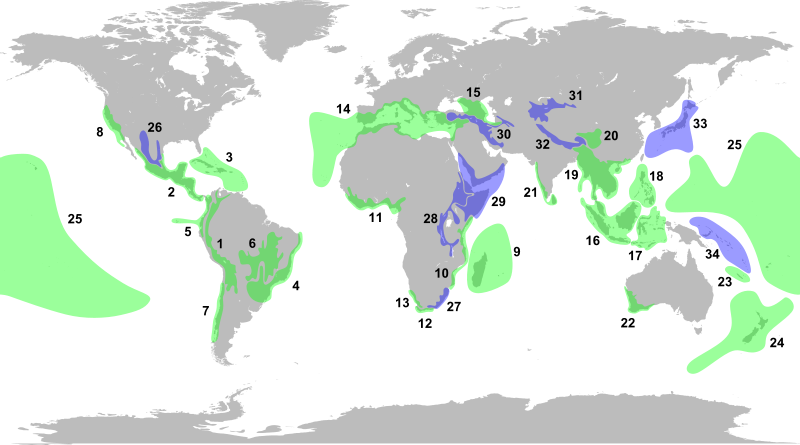 As per the review, there are high chances that the missing species are situated in the biodiversity hotspots which are geographically difficult to access and are in politically unstable regions. So places like Central America, northern Andes, South Africa, and New Guinea will have a bevy of unknown species in the earth, hints the review. According to the scientists, restricted geographical range as well as severe habitat loss will make them listed as endangered or critically endangered, if not extinct, right when they are described. The study also highlights that the existing figures on biodiversity are often miscalculations due to issues like synonymy and hyper estimation in biodiversity assessment. According to the review, synonymy, or describing similar species under different names, by taxonomists from different continents and generations is a major issue in understanding the real picture of biodiversity. Often, the possible number of species in a specific family is estimated based on the number of known species. While synonymy always makes such estimation incorrect and inflated, incorrect extrapolation of data which is specific to a locality or habitat to chalk out a worldwide estimation will also give inflated figures on biodiversity, says the study. The study also points out that the method of assessing the number of missing species based on a sample of known and common organisms often leads to miscalculation of missing species. “Even well-known vertebrate taxa are now yielding surprising numbers of new species, overlooked because of their small ranges or because of cryptic species complexes”, says the study. Cryptic species are a complex of morphologically similar organisms belonging to closely related species. Such species are often overlooked in missing species estimations, due to their small geographical range. According to the paper, the inability to trace and record the identity of all existing organisms on the earth is greatly making academicians and policy makers to under estimate the biodiversity crisis we are actually passing through. According to studies, human intervention has been driving many organisms to extinction at 100 to 1000 times faster than their natural rate. Increasing extinction rate calls for immediate species discovery efforts, says the study. Brett R. Scheffers, National University of Singapore, Lucas N. Joppa, Microsoft Research, UK, Stuart L. Pimm, Duke University, USA, William F. Laurance, James Cook University, Australia co-authored the review.